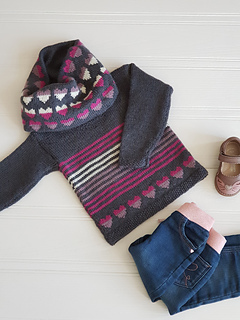 This cute sweater is knitted from the bottom up with a little stranded colour-work for the heart motifs, just perfect as a first stranded knitting project. Simple shaping and clearly written pattern instructions will have you knitting this in no time at all. The cowl is worked in the round and the hearts are worked using stranded knitting, a great piece for practising your skills. 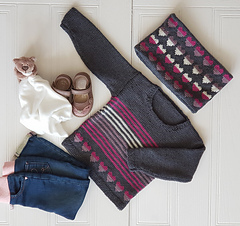 Both pieces are sized to fit 1—11 years and are knitted using Willow & Lark Ramble DK, a beautifully soft 100% wool yarn. Yarn: Willow & Lark, Ramble DK, (100% wool, 125m / 136yds per 50g ball), (A) shade 105, Thunder Grey 2 (3: 4: 6: 6: 8) 50g balls; (B) shade 129, Wisteria 1 (1: 2: 2: 2: 2) 50g balls; (C) shade 128, Raspberry 1 (1: 2: 2: 2: 2) 50g balls; (D) shade 101, Snowdrop 1 (1: 2: 2: 2: 2) 50g balls. Yarn: Willow & Lark, Ramble DK, (100% wool, 125m / 136yds per 50g ball), (A) shade 105, Thunder Grey 1 (2: 3) 50g balls; (B) shade 129, Wisteria 1 (1: 1) 50g balls; (C) shade 128, Raspberry 1 (1: 1) 50g balls; (D) shade 101, Snowdrop 1 (1: 1) 50g balls.